Ambulex is the only UK exhibition exclusively targeting ambulances and other emergency support and rescue vehicles. It attracts visitors from the UK and overseas, mainly public and private ambulance fleet personnel, including the military, as well as senior NHS Trust managers and emergency rescue service managers. We already provide AutoSock to many Ambulance services and will be at Ambulex 2012 to demonstrate this amazing product to new fleet managers. 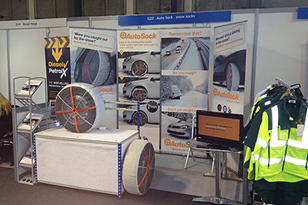 It's good to know that our Emergency Services will be able to respond, whatever the UK winter throws at them, if they are carrying a set of AutoSock in their vehicles.